As sunset approaches, a black bear walks along the shore and suddenly jumps into a stream, pouncing on a salmon. He splashes around a few more times, unaware or unconcerned that five tourists are only metres away. 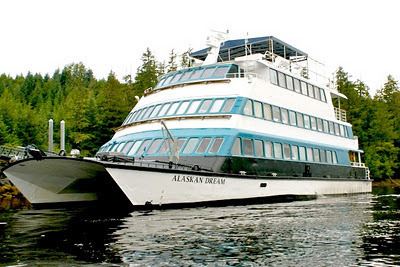 I’m watching from the safety of my Zego runabout (like a large jet-ski) after zipping along the glassy water of Hobart Bay – new cruise line, Alaskan Dream Cruises’ exclusive playground. We have the whole site to ourselves overnight, with plenty of time to go sea-kayaking and riding ATVs around the old logging roads through coastal rainforest. In a destination that is famous for cramming six superliners into one port, it’s a treat to be alone in Alaska. For the past few days, our small ship has escorted 35 passengers around the glory of Glacier Bay and Tracy Arm, to view humpback whales, seals and sea otters, and to go zip-lining down North America’s tallest flying fox. Last night we feasted on locally caught king crab at Orca Point Lodge – another wilderness retreat not used by any other cruise line. Only in Juneau is it impossible to avoid the crowds – but there is one way to escape. From next year, Alaskan Dream will offer the option of a guided walk along the Mendenhall Glacier, landing on the ice by helicopter. I snuck off for a preview, and it was the highlight of the week. To be walking on a glacier is an amazing experience after days of gazing at them. Wearing ice-friendly boots, we are led around the blue-white wonder, exploring its tall walls and deep crevices, and at a flowing river of water, we stop to scoop up a handful for a drink. Back onboard is another opportunity to imbibe an iceberg, when Ernie the bartender uses a freshly crushed piece to create ‘glacier martinis’. I’m fairly sure this makes them healthy! The nightly social hour is a great way to meet your fellow passengers. My voyage saw an affable mix of American, British, Australian and New Zealanders. Owned by a Native Alaskan family, the company’s other standout feature is its cultural program, with expedition leaders and guest speakers from the local Tlinglit tribes explaining the sights, history and traditions of the region. Editor’s verdict: If the thought of forging through Alaska in a big ship leaves you cold, Alaskan Dream provides the ultimate alternative. Without doubt, this was my favourite cruise of the year (out of 12 so far). The spectacular destination, well-planned itinerary, exclusive access, fun activities, great seafood, friendly crew and Tlinglit touches offer the whole package of adventure, scenery, culture and comfort. Book now for 2012 An eight-day ‘Inside Passage Sojourn’ on Alaskan Dream, departing from Sitka, is priced from US$3,229 per person twin-share including guided shore excursions and activities (except the zip-line and glacier walk), gourmet meals and wine with dinner. From next year, a Stikine River jet-boat tour will be included. Three-day and six-day cruises are also available, priced from $1,495 per person. To book, contact the Small Ship Adventure Company on 1300 650 481 or see www.smallshipadventure.com.